This is the title of a popular book by Kai-fu Lee, former president of Google China and now an energetic guru of micro-blog whose followers on his two accounts, at Sina.com and QQ.com, have reached 14 million. Micro-blogging is also changing China, rapidly and in multiple aspects. Celebrities disclose their private lives to amuse and attract fans, newspapers and magazines collect information and pitch stories, and activities such as charity fund-raising, marketing and matchmaking have galvanized netizens who may lack the resources to make their concerns heard in real life. Micro-blogs have created a new expression, "Circuseeing changes China." Recently, an ongoing online public campaign to aid the police in the fight against child begging has heightened the craze for "micro power." This coverage aims to summarize the major themes, landmark events, and influences on Chinese society. Micro-blogging has become a super star attraction. Individuals, business organizations, educational institutes, NGOs, and government officials have rushed onto the addictive platform and are striving to market their products, ideas or activities by making the best use of its communication power. Following are some landmark events on micro blogs. Unlike Liang's individual and heroic charity initiation, a growing number of NGOs have joined in micro-blogging to organize campaigns, answer inquiries and raise funds to increase engagement with stakeholders and communities. By Feb 22, there were 57 foundations registered at t.sina.com.cn, one of China's most active micro-blogging services, specializing in a broad range of agendas, such as breast cancer, green travel, business innovation, poverty relief, and saving tigers. Another 36 environment organizations and 61 civil societies also use social media to promote humanitarian concerns over issues of child education, book donation, homeless animals, and information sharing. By combining photos, video and text, micro blogs have facilitated the communication of their causes in a highly cost-effective way. With excessive information being produced every second on micro blogs, the only thing that matters in the world of social media is attention, attention and attention. Unfortunately, sometimes it is created by irresponsible, sensationalized gossip. On Nov 2 and 3, "Leslie resurrection" became one of the most commented on topics on t.sina.com.cn, after Guo Jingming, one of China's best-selling authors, published the dubious message. He did not mention explicitly that Hong Kong singer and actor Leslie Cheung came back to life in his message, but followers posted comments suggesting Leslie didn't commit suicide. The number of comments on the rumor rocketed to 30,000 until Guo deleted the message. Media reports later said that a Shanghai-based communication company masterminded the gossip with possible consent from Guo Jingming. The whole scheme was to show off its "communication power" to clients. Started in 2007 as a specialty men's shirt e-retailer, Vancl has become the No 1 Internet apparel brand in China. But the brand snatches the market share not only for its products but also for the so-called "Vancl language style," which imitates the firm's advertisement lines and swept through the micro blogs. Vancl's succinct lines mock the airs and graces of the mainstream, and stiff business slogans by commercializing Han Han, a race car driver and pop novelist known for his independent thinking, and rising actress Wang Luodan. Photos of Jackie Chan, David Beckham and Internet celebrities were edited by untraceable authors and combined with hilarious, rhythmic texts to trigger a fever of this genre of expression. The company repeatedly denied it was behind the language phenomenon, but it did cooperate with Sina.com to provide its products to selected micro-bloggers. Lu Xun (1881-1936), one of the most influential Chinese writers, detested one strain of the Chinese national character, that people are fascinated with spectacle. In his satirical writing, apathetic Chinese people gather mindlessly to watch their compatriot being executed. This rubberneck phenomenon, weiguan in Chinese, finally develops into a powerful force and carries on more positive implications on the micro blogs by supervising governmental officials, exposing corruption and scandals, holding wrongdoers accountable, and promoting social justice. As more and more people forward posts and add comments, it attracts people's growing attention and put power abusers under the spotlight. Scholars are not shy about lending their support to new social media. Chen Peiai, a professor at Xiamen University, said micro-blogging has significantly lowered the threshold of expression for the public and enabled the receiver of information to become the publisher. Yu Guoming, of Renmin University, emphasized the importance of micro-blogging in expanding people's ability to act. Following are some cases of rights defense that caused upheavals first on the Internet and then in real life. Micro-blogging played a crucial role in helping 22-year-old Zhong Rujiu to seek justice in the notorious case of forceful demolition in Yihuang, East China's Jiangxi province. "My Father is Li Gang!" "My Father is Li Gang!" became one of the most popular catchphrases in China, also due to the power of micro blog. At Baoding-based Hebei University, a drunk driver reportedly shouted the words when he was stopped by security guards after knocking down two students. Li Gang was later identified as deputy director of the public security bureau of Beishi district of Baoding city. A 28-story residential building in Jing'an District, a densely populated area in Shanghai, caught fire on Nov 15 when it was being renovated. The blaze left 58 dead, and it was blamed on lax oversight and illegal practices. Tens of thousands of people flocked to mourn the victims on Nov 21. On the Internet, some called for the release of the names of the dead, but officials said more than one-third of victims' families were not willing to release such information. It was later reported that relatives of each victim will receive compensation of 960,000 yuan ($144,500). On Nov 3, Tencent said "it made a very difficult decision" to shut down its popular instant messaging service QQ on computers installed with anti-virus software 360. The war broke out after previous verbal attacks. In late September, 360 alleged QQ was leaking users' private data and offered a new service on 360 Safe to prevent privacy leaks, while Tencent accused 360 of slander and business foul play. The dispute, a business war under the guise of protecting users' rights, alarmed netizens about online privacy. Surveys showed that 57 percent of Chinese netizens are willing to turn their backs on QQ following its arrogant ultimatum, but many also admitted that QQ is just too popular to boycott. Two remarkable micro blog–based events in 2010 are both related to Fang Zhouzi, a famous science writer and a "science cop" for his battles against pseudoscience and academic misconduct. When he disclosed on his micro blog that former president of Microsoft China Tang Jun fabricated his academic credentials in the United States, he had no idea of how it would evolve into a national sensation. Tang said he received his PhD from the California-based Pacific Western University, but Fang pointed out that it was a "fake and problematic university." A leaked list later showed that more than 100 Chinese, including lawyers, civil servants and senior managers, received credentials from the "diploma mill." Fang's persistent efforts to expose bogus research and academic fraud also put him in danger. On Aug 29 near his home, he was attacked by people with pepper spray and a hammer. Fang suffered slight injuries in the attack. Later, police found Xiao Chuanguo was the behind-the-scenes plotter and he also masterminded another attack on Fang Xuanchang, an editor of the financial journal Caijing, on June 24. Xiao took revenge on the two writers as he believed their revelations of his academic fraud led to him to failing to become a member of the Chinese Academy of Sciences. Chinese stand-up comedian Zhou Libo has a huge following for his quips and gags in Shanghai but many still suspect his Shanghai dialect may limit the number of his audience. However, when he called the Internet "a public toilet" where netizens throw their "private crap" on his micro blog on Nov 20, the comments sparked public anger and about 200,000 of his followers deserted in protest. Micro-blog, or weibo in Chinese pinyin, is a broadcast medium in the form of blogging. A micro blog differs from a traditional blog: Each post on a micro blog can only contain short sentences of no more than 140 Chinese characters, with pictures or videos links. Besides the Web-based interface, micro blog users can use text messaging, instant messaging, e-mail, or digital audio to publish entries. A micro-blog user can choose to "follow" other users and launch talks and make comments on others' posts. At present, the most popular micro blog service providers are Chinese Internet portals such as Sina, Sohu, Netease and instant messaging tool QQ. Jiwai.de and Fanfou.com In as early as 2007, China had two websites imitating Twitter, which provided micro blog services to Chinese Internet users. China's Internet portal Sina.com started its internal test edition of micro-blog site Sina Weibo on Aug 14, 2009, thus giving birth to China's first micro blog. Sina wastes no effort in persuading company CEOs and celebrities to open micro blogs. Two other Internet portals, Sohu.com and 163.com, tested their micro-blog sites almost simultaneously, on Jan 20, 2010. Sohu was the first to open its micro blog service to its blog users. Ten days later, another Internet giant, Tencent, announced it had closed its first weibo service "Taotao", which was not operating well. Tencent officially launched its new micro-blog service on March 5, 2010. Based on the large number of its instant messaging service users, t.qq.com made personal socializing groups and grassroots personalities its major promotion focus. t.163.com, the third micro-blog service based on portal sites in China was launched. Based on its strong email service user base, the service provided by Netease extended the word limit for every post from 140 to 163. For celebrity users, the limit was extended even more, to 188. A Sina Weibo-compatible API platform was launched. According to a report released by news portal sina.com in September, the number of China's micro-blog users reached 103 million, about 24.5 percent of China's 420 million Web users. The number of followers for Chinese hurdler Liu Xiang on t.qq.com reached 10 million, the largest following on a micro-blog. Tencent announced that its micro-blog users surpassed 100 million. First information about last year's catastrophic Zhouqu mudslide was released through Sina Weibo by a 19-year-old micro blogger. A woman was charged 3,900 yuan by China Unicom for tweeting from Moscow last December, and it was called the "most expensive micro blog ever." An SOS micro blog on Sina.com provided enough blood for the operation of a patient with malign tumor, within 16 hours in Beijing, which saved his life. Louis Cha, famous author of martial arts novels, was falsely reported dead on the micro blog of a weekly news magazine,which led to the resignation of a deputy editor-in-chief and two Web editors. Sina Weibo's No 1 celebrity, comedian Yao Chen, announced her divorce on her micro-blog in January, following the news that the number of fans on her micro blog reached 5 million. Not only has micro-blogging become the trendiest social networking model for Chinese netizens, more and more Chinese officials are resorting to micro blogs to communicate and hopefully win support from the public, building images contrary to the drab portrait of Chinese officials who tend to be restrained and stuck to scripted lines. Authorities in 59 cities and regions - including Chengdu and Yinchuan - launched official micro blogs in 2010. Police across China have taken to micro-blogging as a means of interacting with the public, as the force seeks to change its image and ease tensions that usually arise from complaints being handled improperly. With short sentences, pictures, and videos for a micro blog post using a cell-phone, the Twitter-like service creates a new wave of online activity, including participants from primary school students to government officials. Tweeting has become a popular cultural scene for Web users, and the country's ancient culture has also become modern and easy to understand as agencies such as the Palace Museum start to run micro blogs that focus on China's cultural legacies. i s among the top five celebrities of China's news portal Sina.com's Twitter-like micro blog. 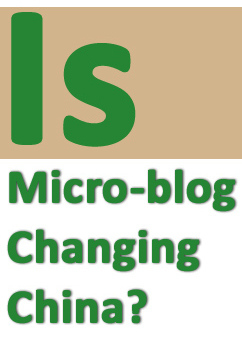 His latest book, Micro-blog: Changing the World, tells of the new Internet application's importance. "Micro blog is changing everything because micro blog is the best communication platform, best mechanism for right protection, best substitute for online information portals and best brand builder." Yu Jianrong, professor of rural development at the Chinese Academy of Social Sciences and also an initiator for an ongoing campaign to crack down on child begging wrote in a tweet recently, "After about four months' experience in micro-blogging, I have come to the conclusion that micro blog is a world that can be both far from and near the authorities but deeply rooted in the general public. It's varied in content from every tweet, but definitely comprises reflection on suffering of the people and outcries for social justice." s aid, "You have to make efforts and contributions to let others benefit and get recognized. Through micro blog as a system starting from grassroots, a not-so-good person is made better and a good man continues to do good...Micro blogs are changing ourselves, making us fair, just and kind-hearted, and will change the country in the future." Feng Xiaogang, renowned Chinese film director, also a micro blog celebrity, said, "I feel great having my micro blog as my own news agency that never misinterprets my words." Wang Zhongwu, a professor of sociology at Shandong University in Jinan, said, "Comments posted on the Internet might be uncomfortable to the ears of authority, but officials have to hear uncomfortable truths to improve their ability to govern." Xie Yungeng, deputy director of Shanghai Jiao Tong University's Institute of Arts and Humanities, said, "The increase of public opinion on the Internet can help reduce information asymmetry in the government's decision-making process, promoting objectivity and fairness in public policy assessment." Micro-blogging pushes social progress in terms of better government information transparency and public monitors on official misdoings as well as better aid to disadvantaged groups. BUT, Fake information and slanderous rumors spread by micro-bloggers cause waste and make trouble for people. Micro blogs create new opinion leaders as well as promote open discussion on controversial issues and fair and factual news reporting. BUT,most tweets are about personal life and entertainment gossip and stimulate no action from micro-bloggers, with only verbal utterances of anger or sympathy when it comes to topics of public interest. In an era of "circuseeing"(围观) through micro blogs, we are perhaps speeding up the creation of history. *"Circusee," circus + see, is a word coined by Chinese Web users that became an online buzzword after micro blogging became popular last year. It describes the behavior of Internet users paying a lot of attention to something or somebody online. If somebody is "circuseen" on a micro blog, he or she has a large number of followers.